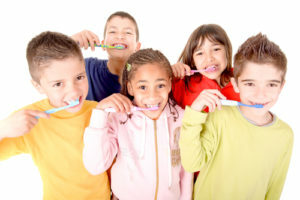 Home » Blog » general dental » Young Kids and Cavities – What’s Normal? Young Kids and Cavities – What’s Normal? Cavities occur when the food particles left on the teeth have not been brushed away after eating. The acid starts to collects on the teeth and slowly softens its enamel until a hole, better known as a cavity, starts to form. At times, we do not realize that a cavity has formed in the teeth. Upon the routine checkup, the dentist discovers a cavity has started to form. If the cavity is caught in its initial stages, the dentist is easily able to fill the cavity without you feeling a thing. But is the cavity is not treated in due time, it starts to deepen until it touches a nerve. That’s when you feel a sharp pain and have no choice but to pay your dentist a good amount and have your tooth extracted. Tooth decay has been found to be one of the common childhood diseases that can occur in young kids. Many factors play a role in the occurrence of tooth decay. Being a parent, there are some measures you can put into practice to help reduce or prevent the development or incidence of dental caries. How can you help prevent cavities/ dental decay in your child’s teeth? It is extremely crucial that the child brushes their teeth before going to bed. The most common reason why young kids develop cavities is that they sometimes go to bed without brushing their teeth. All that they ate throughout the day, the food particles are left in the mouth, which eventually leads to cavities. Make sure your child brushes regularly. Flossing is just as important as brushing. When you floss, it helps to remove the food particles in those areas where you could not brush. When your teeth are nice and clean, the chances of cavities forming in your teeth are slim. Make sure your kids brush at least twice per day, especially before bedtime and after mealtime. Try to give your child less sugary and sticky foods. Such foods have a tendency to adamantly stick to the tooth and erodes the enamel, which eventually leads to cavities. Even if your child brushes their teeth, there is a chance they will not be able to effectively brush all the sugar from their teeth. Use a fluoride toothpaste. Fluoride is a vital part of good dental health because it restores calcium to the teeth and limits the formation of corrosive acid. Visit the dentist on a regular basis. Young kids are not aware of the importance of proper oral hygiene. As a parent, it is your job to make sure your kids properly brush and floss their teeth. It is also imperative that you take them regularly to the dentist for a routine checkup. Taking preventive measures can make the difference in saving your child’s tooth from having it extracted. If your child complains of a toothache, do not ignore it. Schedule an appointment with your dentist at once. Give us a call at Angel Dental in El Monte to set up an appointment with you child – 626-444-2002. We are great with kids, and help keep your child’s teeth in top shape.